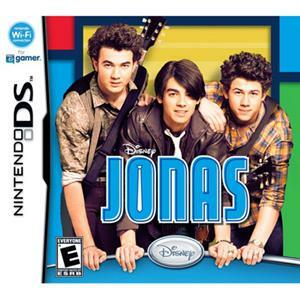 Jonas for DS... Live out the rock star life of the JONAS band members and find out how everyday life collides with the pop star world in the new JONAS video game for Nintendo DS. Inspired by the latest hit Disney Channel Original Series, JONAS invites fans to play as band members Nick, Joe and Kevin in non-stop, hilarious adventures set in exciting TV show locations, featuring JONAS music and friends Stella and Macy. Tear up the stage, juggle school and friends, and still make it home in time for dinner. Players must stay on their toes and steer clear of JONAS-mania in this musical adventure with their favorite superstar idols.